Nancy Michaels’ three-decade career in communications and marketing began when she worked with Tom Bergeron (“Dancing with the Stars”) when he was in Boston at WBZ-TV. Over the years, she has become a nationally-recognized business development advisor to small businesses, professional service businesses, and the healthcare industry. 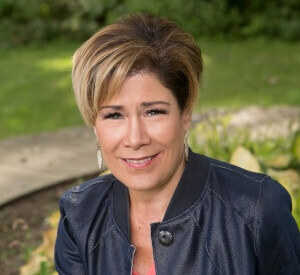 She has brought creative, practical and straightforward ideas to her audiences with her many articles and books (Stripped: Life Lessons Learned from Almost Dying, Dating Success After 40 with Neil Wood, Off the Wall Marketing Ideas with Debbi Kickham, and Perfecting Your Pitch). She was named Small Business Woman of the Year in 2005 by the Women’s Business Enterprise National Council (WBENC) and was the first recipient of the Tom Peters WOW! Project Personified Award for her innovative work with Fortune 500 companies to deliver dynamic content to small businesses (which earned her a Fast Company cover story). Her company, Impression Impact, produced live and web-based events for clients such as Office Depot, UPS and Staples. Her Huffington Post blog showcases her style injected with incredible humor and levity often taken from the mundane to the sometimes-tragic aspects of life. And she has been recognized in such national media as Entrepreneur Magazine, US News & World Report, CNN-FN, Fox, Inc.com, and The New York Post, among numerous others. Nancy is also known as an inspirational keynote speaker whose motivational talks leave audiences with the distinct belief in themselves that they can overcome anything—as she personally has. At age forty-one—and physically the picture of health and wellness—Nancy suddenly became deathly ill and underwent an emergent liver transplant. Pronounced clinically dead twice during the surgery, her medical team wondered if she would ever be the same cognitively, especially after experiencing significant medical complications that resulted in her undergoing emergency brain surgery while in a two-month-long coma. When she awoke, she was unable to move or speak and had to go to rehabilitation to learn to stand, walk and take care of herself once again. Miraculously, that extensive rehab left her with no residual effects—but the experience did irrevocably change her life and her message to audiences. Nancy’s personal story of overcoming immense adversity makes her one of only very few people uniquely qualified to help organizations better understand healthcare through the patient lens, and inspire small business owners to tap into their own innate ability to not only weather the tsunamis of life and business, but to also come out on the other side with a new and more positive view of both. Nancy’s message is all about health—both personal and business—and she is available to motivate audiences to take stock of their own.